American astronaut who became the first American woman to orbit the earth when she flew aboard Space Shuttle Challengeron 18 Jun 1983. Only two women preceded her in space: Valentina Tereshkova (1963) and Svetlana Savitskaya (1982), both from the former Soviet Union. Ride applied to the astronaut program after reading an ad in a newspaper. Out of 8,000 applicants to the space program that year, 35 individuals were selected including six women. Accepted into the astronaut corps in 1978, she completed her training as a mission specialist in 1979, and flew on two missions with Challenger, the second in 1984. Dr. Ride, a Ph.D. physicist, was a member of the team chosen to investigate the 1986 explosion of Challenger. Born 26 May 1876; died 3 Feb 1956 at age 79. Robert Mearns Yerkes was an American psychologist and a principal developer of comparative (animal) psychology in the U.S. In his book The Dancing Mouse (1908), he helped established the use of mice and rats as standard subjects for experiments in psychology. He also studied primates, publishing his results in 1929 in the classic book The Great Apes. Born 26 May 1874; died 18 Jul 1958 at age 84. French aviator and aircraft designer who developed ailerons (1908) to solve the enormously difficult and dangerous problems of lateral control. His an innovation subsequently came into general use on all planes. His first steps in aircraft design began in 1907 when he ordered his own aircraft incorporating his design modifications of a dihedral in the wings and the reduction of the tail to a single plane. These intuitive rather than scientific modifications were the beginning of a long career in which Farman diagnosed and solved a myriad of aircraft control and structural problems. The Farman “Goliath” was the first long-distance passenger airliner, beginning regular Paris–London flights on 8 Feb 1919. His younger brother Maurice Farman was also an aviator. They were born of English parents in Paris. Born 26 May 1867; died 10 Jan 1937 at age 69. Born 26 May 1837; died 21 Jul 1926 at age 89. American civil engineer under whose direction the Brooklyn Bridge, New York City, was completed in 1883. The bridge was designed by Roebling with his father, John Augustus Roebling, from whom he had gained experience building wire-rope suspension bridges. Upon his father's death, he superintended the building of the Brooklyn Bridge (1869-83). He was disabled by decompression sickness after entering a caisson in 1872. He was brought out nearly insensible and his life was saved with difficulty. Because of resulting poor health, he directed operations from his home in Brooklyn overlooking the site. Though he continued to head the family's wire-rope manufacturing business for several years, medical problems forced retirement (1888). Builders of the Bridge: The Story of John Roebling and His Son, by David Barnard Steinman. - book suggestion. Born 26 May 1832; died 30 Jan 1908 at age 75. Born 26 May 1826; died 27 Nov 1875 at age 49. Born 26 May 1815; died 24 Jan 1879 at age 63. French mathematician who was a pioneer in the development of analytic trigonometry and in the theory of probability. He published The Doctrine of Chance in 1718. The definition of statistical independence appears in this book together with many problems with dice and other games. He also investigated mortality statistics and the foundation of the theory of annuities. He died in poverty, and correctly predicted the day of his own death. He found that he was sleeping 15 minutes longer each night and from this the arithmetic progression, calculated that he would die on the day that he slept for 24 hours. Died 26 May 2003 at age 75 (born 20 Apr 1928). Gerald Stanley Hawkins was an English-American radio astronomer and mathematician who used a computer to show that Stonehenge was a prehistoric astronomical observatory. In the 18th century, William Stukely had noticed that the horseshoe of trilithons and 19 bluestones opened up in the direction of the midsummer sunrise. Hawkins identified 165 key points that correlated the stones and other archaeological features of the neolithic complex to the rising and setting positions of the sun and moon over an 18.6-year cycle. He first published his findings in an article, Stonehenge Decoded, in the journal Nature (1963), and then in a book with the same title (1965). In Beyond Stonehenge he explored the mysteries of Machu Pichu, the Nasca Lines, Easter Island and the Egyptian Temples of Karnak and Amon-Ra. In the 1990s, he studied the geometry of crop circles. Stonehenge Decoded, by Gerald S. Hawkins. - book suggestion. Booklist for Gerald S. Hawkins. Died 26 May 1999 at age 100 (born 10 Sep 1898). American chemical engineer who invented plasticized PVC (vinyl). In 1926's, he discovered how to convert polyvinyl chloride from a hard, unworkable substance to a pliable one. It is now used in hundreds of products such as floor tile, garden hose, imitation leather, shower curtains, and coatings. It is produced in larger quantities than any other plastic except polyethylene. Semon also made pioneering contributions in polymer science, including new rubber antioxidants. His technical leadership led to discovery of three major new polymer families: thermoplastic polyurethane, synthetic "natural" rubber, and oil-resistant synthetic rubbers. Semon held 116 U.S. patents. Died 26 May 1951 at age 71 (born 12 May 1880). American explorer, engineer and scientist (original name William Linn Ellsworth) who led the first trans-Arctic (1926) and trans-Antarctic (1935) air crossings. Polar Extremes: The World of Lincoln Ellsworth, by Beekman H. Pool. - book suggestion. American biochemist and pharmacologist who made important contributions to a modern understanding of the ductless, or endocrine, glands. In 1893, he became the first full-time professor of pharmacology in the U.S. at John Hopkins University. Abel encouraged his students to conduct experiments and become active participants in his laboratory research. In 1897 he reported the isolation of a derivative of epinephrine (adrenaline). In 1926, he isolated and crystallized insulin. Abel also investigated the functions of the kidney and devised a vividiffusion apparatus for removing toxins from the blood of living animals, an apparatus that is widely regarded as a forerunner of the artificial kidney. American pathologist, remembered for his contribution in a monograph on amoebic dysentery (1891) which described detailed observations of it and its parasite. His post-M.D. (1878) work included many autopsies, sparking his interest in pathology. He studied in Europe (1880-83), where pathology was more advanced than in the U.S. In his first significant research, he confirmed Laveran's discovery of the sporozoan parasite that causes malaria, Plasmodium malariae (1893-94), and upon returning home, was the first in the U.S. to describe and picture it. Councilman also did research on diphtheria, cerebrospinal meningitis, nephritis, and smallpox. He was the principal founder of the American Association of Pathologists and Bacteriologists. Died 26 May 1922 at age 84 (born 16 Apr 1838). Belgian industrial chemist who invented the Solvay Process (1863), a commercially viable ammonia-soda process for producing soda ash (sodium carbonate), widely used in the manufacture of such products as glass and soap. Although a half-century before, A.J. Fresnel had shown (1811) that sodium bicarbonate could be precipitated from a salt solution containing ammonium bicarbonate, many engineering obstacles had to be overcome. Solvay's successful design used an 80 foot tall high-efficiency carbonating tower in which ammoniated brine trickled down from above and carbon dioxide rose from the bottom. Plates and bubble caps helped create a larger surface over which the two could react forming sodium bicarbonate. Italian chemist who discovered the explosive compound nitroglycerin (1847) by adding glycerine slowly to mixture of nitric and sulphuric acids. When he discovered the explosive power of even a single drop in a test tube, he named the new compound pyroglycerin. Sobrero was horrified by the destructive potential of his discovery, and made no effort to develop that power himself, though it became known as nitroglycerin, or blasting oil. Two decades later, Alfred Nobel combined nitroglycerine with diatomaceous earth, making it safer to handle, but just as useful for blasting rock for construction and mining. Nobel made a fortune as the inventor and manufacturer of dynamite. Died 26 May 1877 at age 72 (born 20 Jul 1804). (1st Baronet, original surname Kay) was an English physician, public-health reformer, and chief founder of the English system of publicly financed elementary education. A medical graduate of Edinburgh University, he was also a cholera doctor in Manchester, a pioneer social scientist and town planner, an assistant Poor Law commissioner, the manager of a large landed estate (Gawthorpe Hall), a would-be politician and a novelist. His surname, Kay, changed in 1842 upon marriage to Janet Shuttleworth. His turbulent political, personal and family life is fascinating in itself and, in addition, sheds light on many aspects of nineteenth century social history. Died 26 May 1862 at age 62 (born 26 Jul 1799). American inventor of an alloy (babbitt's metal: tin 89%, antimony 7%, copper 4%.) widely used for friction reducing babbitt bearings. In 1924, he founded a company that has become Reed & Barton, the nation's oldest independent silversmiths. From 1834, he was superintendent of Alger's Foundry and Ordnance Works (South Boston Iron Works), where he cast the first brass cannon made in the U.S. He patented his successful invention of a journal box for train axles 17 Jul 1739, which suggested the bearings alloy. Innovation and Tradition in the Writings of the Venerable Bede, by Scott DeGregorio. - book suggestion. In 1981, Satya Pal Asija was the first in the U.S. to receive a patent for computer software for his computer program Swift-Answer (an acronym for "Special Word Indexed Full Text Alpha Numeric Storage With Easy Retrieval") that allows users to retrieve narrative information from computers in a human-like manner. The program responds to a user's questions with the most likely answer - despite the user's errors in syntax, punctuation, spelling, and grammar. The user needs no computer programing skills. His application for the patent took seven years to issue. (U.S. No. 4,270,182). He published a book on his experience, How to Protect Computer Programs - a Case History Of The First Pure Software Patent, in 1986. The Model T: A Centennial History, by Robert Casey/. - book suggestion. Booklist for Model T Ford. In 1903, Granville T. Woods, a famous black American inventor, received a patent for an "Electric Railway (U.S. No. 729,481). Woods held numerous patents relating to the electric railway, electrical devices, brakes, and telegraphy for railways. Black Inventors in the Age of Segregation, by Rayvon Fouche. - book suggestion. In 1874, Thomas A. Edison was issued a patent for a device concerning "Automatic Telegraphy and in Perforators Therefor" (U.S. No. 151,209). This was just one of many patents on telegraphy he obtained early in his inventing career. He had applied for his first patent on 28 Nov 1868 for an "Electrographic Vote-Recorder." A couple of months later, his second patent application, on 25 Jan 1869, began a period of nine years of patenting inventions primarily related to printing telegraphs, electromagnetics, switches and circuit for telegraphy. This invention produced a message directly onto a strip of paper such that it was ready to be folded and sent to its destination immediately. Letters were formed by a 5x5 square of 25 punch wires. In 1857, Robert Mushet, an English metallurgist, received a U.S. patent for a method of manufacturing steel which improved the Bessemer process for making steel that would be more malleable. (No. 17,389). His process added manganese in the form of spiegeleisen, an alloy of iron and manganese derived from a Prussian iron ore consisting essentially of a double carbonate of iron and manganese. The softness or hardness of the steel could be regulated by diminishing or increasing the proportion of the triple compound of iron, carbon and manganese. He chose to use the alloy of the Prussian ore because it was more free of sulphur, phosphorus and silicon. Mushet also discovered tungsten steel, an alloy with about 8% tungsten. 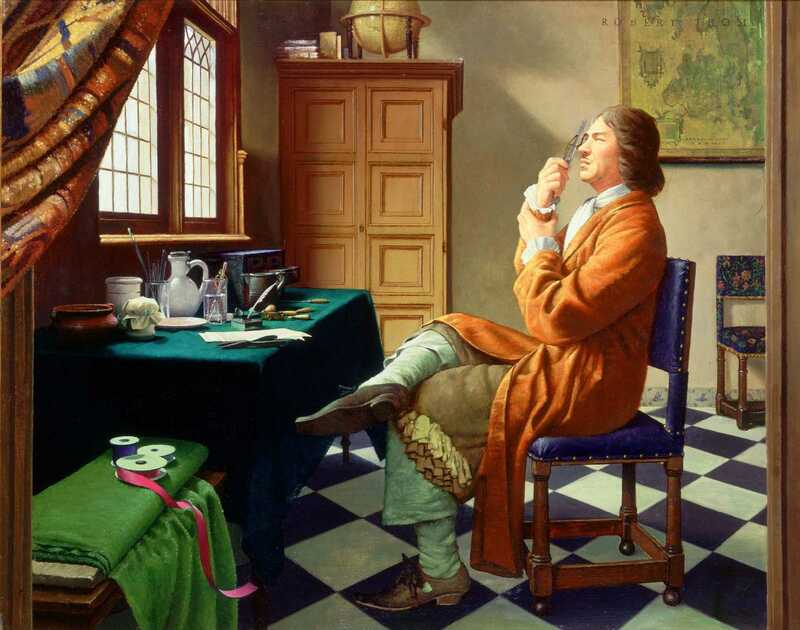 In 1676, Antonie van Leeuwenhoek applied his hobby of making microscopes from his own handmade lenses to observe some water running off a roof during a heavy rainstorm. He finds that it contains, in his words, “very little animalcules.” The life he has found in the runoff water is not present in pure rainwater. This was a fundamental discovery, for it showed that the bacteria and one-celled animals did not fall from the sky. When a ball of molten glass is inflated like a balloon, a small droplet of the hot fluid collects at the very bottom the bubble. Leeuwenhoek used these droplets as microscope lenses to view the animalcules. Despite their crude nature, those early lenses enabled Leeuwenhoek to describe an amazing world of microscopic life. Antonie Van Leeuwenhoek and His "Little Animals", by Antonie Van Leeuwenhoek. - book suggestion.